Frozen treats in San Francisco are not always top of mind, given it’s usually on the mildly-uncomfortably- cold side here. But healthy, filling snacks that are good for an indefinite amount of time are always good to have on hand. Loaded with protein and probiotics, yogurt is not only filling, but very nutritious. It’s also especially delicious, now that whole-milk yogurt is trendy, and we don’t have to feel guilty for eating it with full fat! Fruit and yogurt are always good together, and chia seeds add more protein, fiber, and healthy fat to round out the nutrition and make these super healthy, and super filling. These popsicles are sweet and refreshing, hearty and healthy, and are ready to go whenever you need them. It also doesn’t hurt that they only take about 10 minutes to make. Hurry up and try em, while it’s still summer! Mash or puree blueberries with water. Add chia seeds, and let sit for at least 10 minutes so the chia absorbs the water. 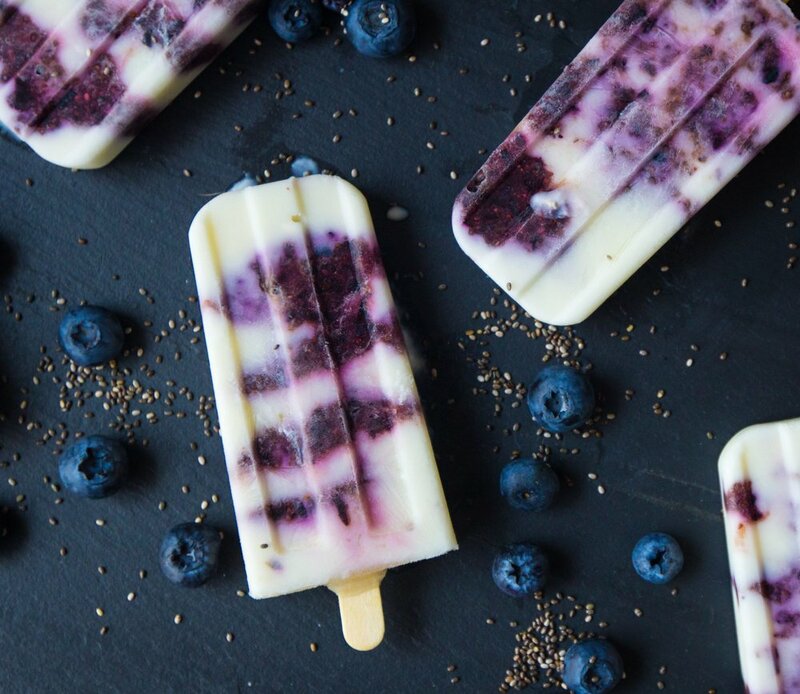 Scoop alternating spoonfuls of the blueberry chia mixture and yogurt into popsicle molds to get a marbled appearance. Freeze for 4 hours, or until frozen.